Die Charakterisierung der Form des medianen Sagittalprofils kann mit Hilfe der Wendepunkte und des Kyphosewinkels als Winkel zwischen den Wendetangenten erfolgen. Der Kyphosewinkel ist damit geometrisch in gleicher Weise definiert wie der Cobb-Winkel. Bei einer Stichprobe, die 61 Patienten umfaßt, wurde der Korrelationskoeffizient zwischen dem Kyphosewinkel und dem Cobb-Winkel im seitlichen Röntgenbild zu 0,87 bestimmt. 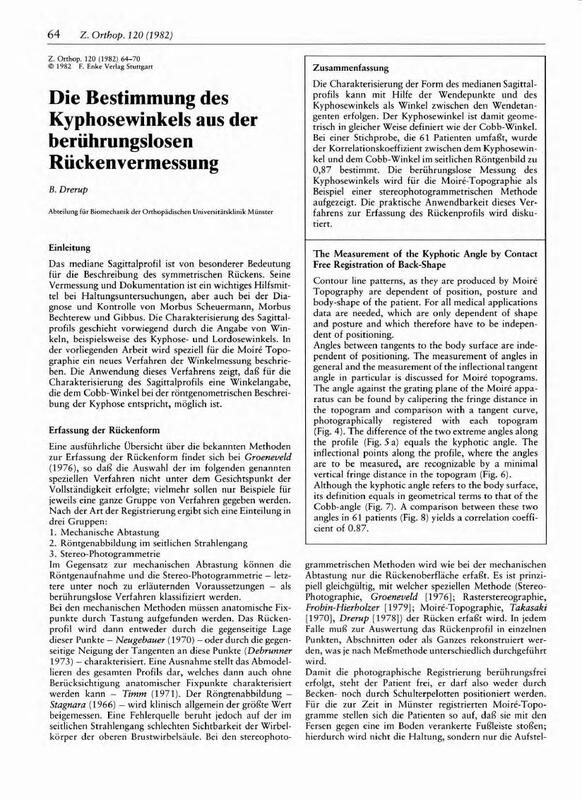 Die berührungslose Messung des Kyphosewinkels wird für die Moiré-Topographie als Beispiel einer stereophotogrammetrischen Methode aufgezeigt. Die praktische Anwendbarkeit dieses Verfahrens zur Erfassung des Rückenprofils wird diskutiert. Contour line patterns, as they are produced by Moiré Topography are dependent of position, posture and body-shape of the patient. For all medical applications data are needed, which are only dependent of shape and posture and which therefore have to be independent of positioning. Angles between tangents to the body surface are independent of positioning. The measurement of angles in general and the measurement of the inflectional tangent angle in particular is discussed for Moiré topograms. The angle against the grating plane of the Moiré apparatus can be found by calipering the fringe distance in the topogram and comparison with a tangent curve, photographically registered with each topogram (Fig. 4). The difference of the two extreme angles along the profile (Fig. 5 a) equals the kyphotic angle. The inflectional points along the profile, where the angles are to be measured, are recognizable by a minimal vertical fringe distance in the topogram (Fig. 6). Although the kyphotic angle refers to the body surface, its definition equals in geometrical terms to that of the Cobb-angle (Fig. 7). A comparison between these two angles in 61 patients (Fig. 8) yields a correlation coefficient of 0.87.